First hoisted in 1191, the historic Flag of St. George became England's flag in 1278. The flag is dominated by a upright, deep-red cross. When combined with the flags of Scotland and the Patron Saint of Ireland, they collectively form the UK flag. 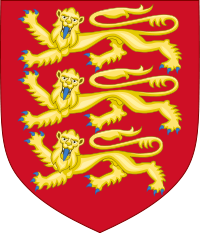 The coat of arms of England has three identical golden lions with blue tongues and claws. They are arranged in a column with a red background.